Description: MEBA at Greenfield East; next stop, East Deerfield yard, a couple miles ahead. Description: The trio of EMD's that brought MEBA into East deerfield don't get much of a rest as they are turned, have the slug set added, and head west with EDNW. Description: BM 340 rumbles across Temple Ave. Date is approximate. Description: To complicate the symbol game even further, this is WARJ. originally, it was EDRJ, and was changed to WARJ, I assume around the same time WAMO was changed back to EDMO. ABCD.... This is one of the few "Phase 1" painted units left. Title: Hark! A train cometh! 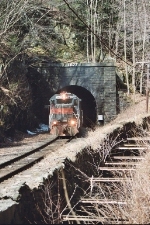 Description: ST SEED, which totally snuck up on me in download North Adams, passes through the 4.75-mile long Hoosac Tunnel. Title: Hark! A train still cometh! 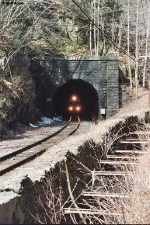 Description: Back in the day, the entire tunnel was 10 MPH, and took nearly 30-minutes to pass through. Now it is 20 and times through have been cut in half. Not good for railfans, since you used to be able to shoot at train in North Adams, then race here and get set-up before the train arrived. 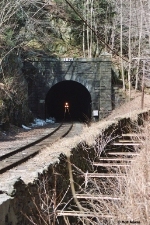 Description: I pity the crews that spent 30 minutes in that tunnel (which, by the way, has signals IN it) - just when their eyes adjust to the dark, bammo, they are confronted with the light. Description: I was very excited to have the 340 leading, since it is one of the few Phase 1 painted units remaining. Description: Passing by the Shelburne Falls Trolley Museum (you can see the poles on the far right) we have head-on lighting for the SEED. I chased this train all the way to East Deerfield, which was my first visit ever to the sprawling B&M yard complex. Description: Switcher 4 led by GP40 340 rounds the curve into Deering Junction. Description: 508 at Town Farm Rd. Description: LA-1 heads west through Andover. Description: BM 340 leads a 50 car, loaded Mt. 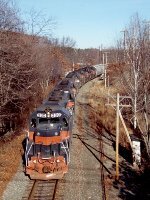 Tom coal train through the East Deerfield yard. Train EDMO does some switching in the yard to the left. Description: BM 340 leads a loaded Mount Tom Coal Extra through the East Deerfield Yard and past train EDMO. Description: BM 340 leads a loaded Mt. Tom Coal Extra toward Elm Street. 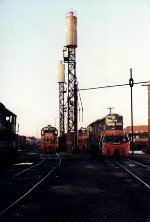 Description: BM 340, MEC 306, and MEC 379 cross the Connecticut River while switching the Mt. Tom Power Plant.